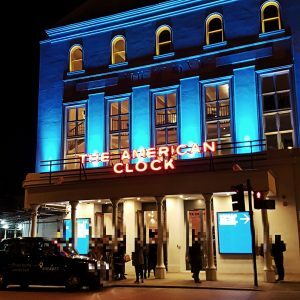 Last night I got to see The American Clock at the Old Vic theatre. 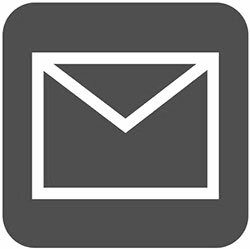 The theatre is currently undergoing refurbishments, and I was worried this would impact on the experience, but they were very organised and well prepared. 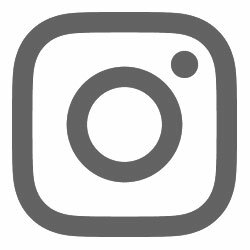 There are currently no loos available in the building, ample temporary facilities on the side of the building cover patrons’ needs, and there really are A LOT of women’s loos. Finally no need to queue in the interval! The American Clock starts with a stock market scene in 1929, the market is just about to crash, changing the American social landscape severely. We meet a colourful cast of characters, eventually settling on the Baum family. Mother Rose, father Moe, and son Lee are the main focus of the play, represented by three sets for actors in almost identical clothing. The production follows the family as they slide from affluence in an opulent 11 bedroom apartment to destitute in a tiny home about to be repossessed. The whirlwind production shifts from character to character, scene to scene, weaving a fascinating thread of the decline of the American dream and the plight of the American people in the early thirties through to the eventual resolution with renewed belief in capitalism. As the main characters are portrayed by several actors, sometimes on stage together mirroring each other, sometimes interacting with one another, it feels like a simile for the huge amount of people that were affected in similar ways by the great depression and the far reaching impact of the formerly well off. 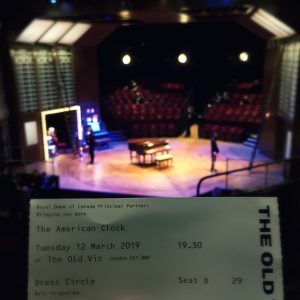 With a gorgeous musical accompaniment, the two and a half hour play is entertaining, informative, and fascinating. The staging is done very well and features strong performances all around. I really enjoyed the evening and am rating An American Clock five out of six rainbow sloths!